Calling all active enthusiasts! Or anyone who wants to try something new! When you work out or play sports you take off your rings, right? Taking it off is a must, but a bit of a pain, so that it doesn’t catch and snag on equipment. You could hurt your finger in a serious way if that happened. 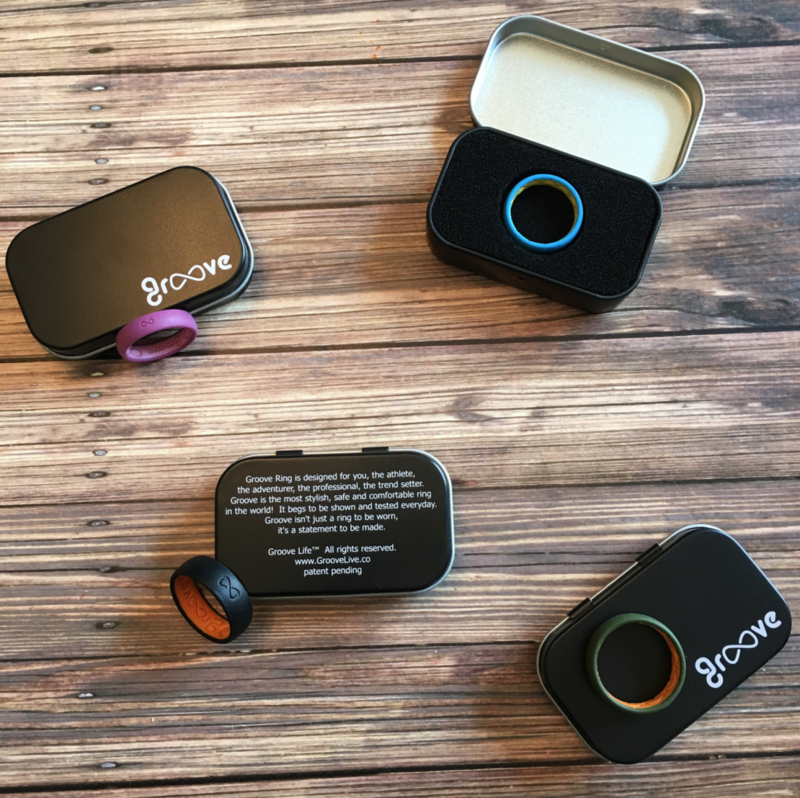 But have no fear because now Groove Rings are here. 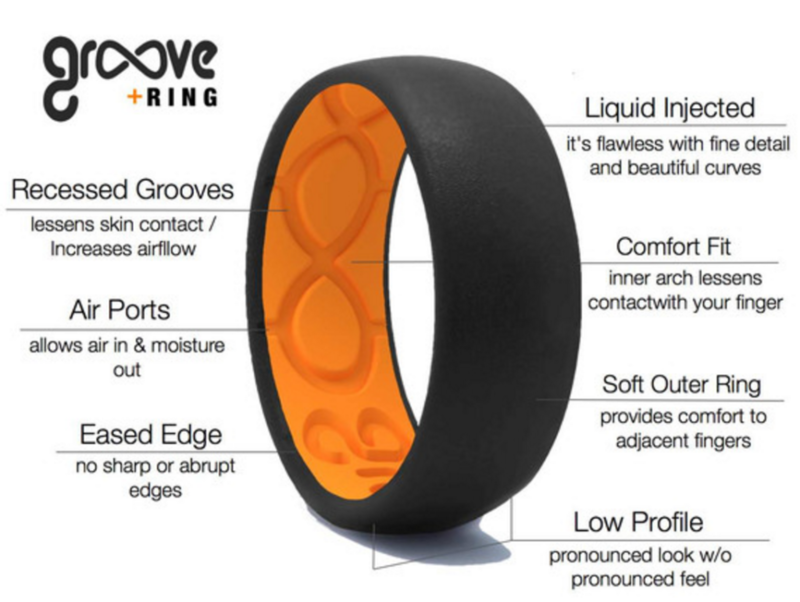 The only active silicone ring on the market that is snug and breathable. See those cut in grooves inside the band? Hence the name! That is what allows the breathability of the ring. Very comfy and you don’t even really know it’s there as it doesn’t affect any of your physical activity. They say weight lifters rave about them because it doesn’t cut into their fingers. I think that is great! Made from 80 durometer medical grade silicone – a soft, but strong material that resists everyday common chemicals like gas, oil, cleaning products. It is also heat resistant and hypoallergenic. Wear it everyday, all day! It does fit very snuggly which is a good thing. I recommend sizing down if you are in doubt. Hubby and I both used their measuring tools to size our fingers and I think we’d both go a size down if had to do it again. They have 7 different styles. Don’t you love the color combos? They are either Original shape or Thin, which is what I am wearing above. Know someone who needs a stylish, comfy ring? Perfect for athletes, but I also think they would be a fabulous first ring for kids or an alternative wedding ring? The Thin start at size 4. At $29.95 they are very affordable. Free Shipping and a Lifetime Warranty. How can you not want to try them?! Original storm grey size 7, Thin black size 9, Original blue size 11. 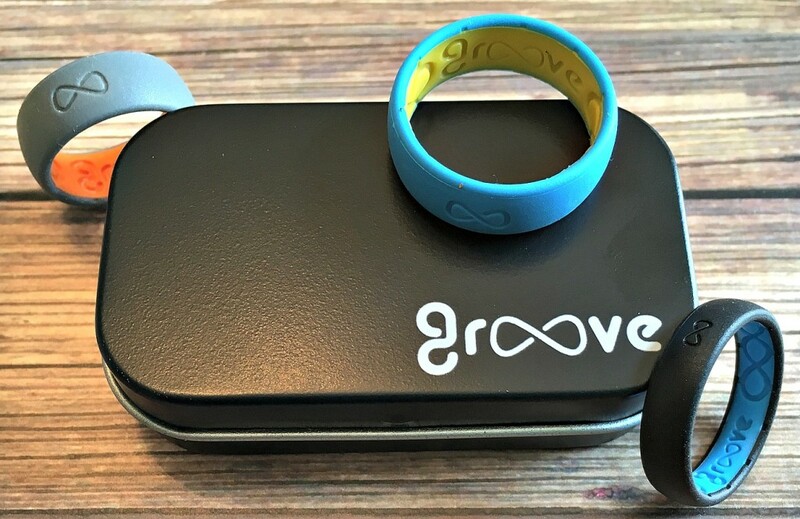 I partnered with Groove Rings for this sponsored post. All opinions are definitely my own. This giveaway will end on Aug. 17, 2016 at midnight MST. Winners will be drawn via rafflecopter. Once a winner is drawn I will contact them and they will have 48 hours to reply before I draw a new winner. Giveaway is open to anyone in the US and you must be 18 years of age or older. Giveaway not affiliated with Facebook & I release them of liability. Winner will be posted in the rafflecopter widget. Happy 3 Years to Me! 3 Winner Giveaway! Yes, these are super cool. Love Them!! I love these rings in all the great colors I know I like them and so would my daughter she would really love one too. I would love one for myself! these are so cool thanks for the chance to win them! This would be perfect for my hubby to wear at work! I would love this for myself! I've heard about these. 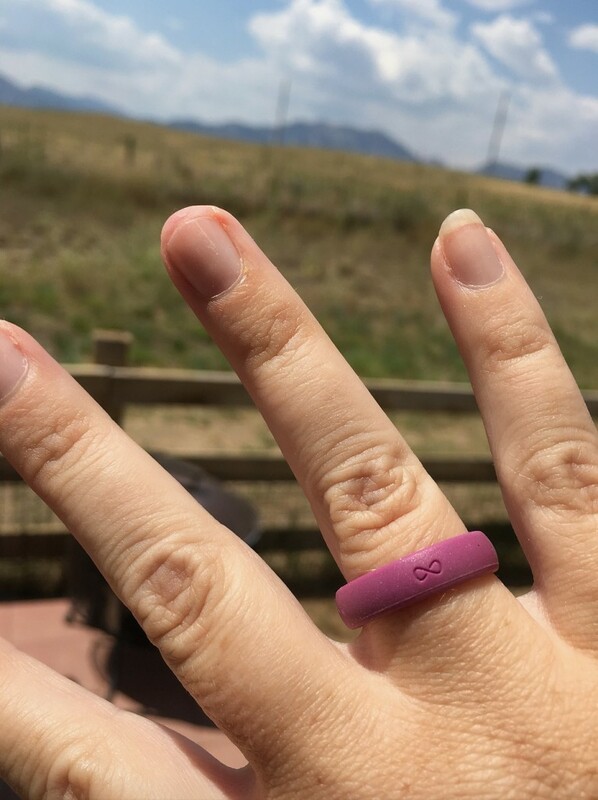 My hubby was actually telling me about "these silicone rings" he'd heard about the other day. lol (I've seen them before and knew what he was talking about.) He thought they were really neat for working in the yard, beach, working out, etc. I think it may have been a hint. lol! I think they are neat too, so I wouldn't mind having one either! I think I would give one to my husband. He's picky about jewelry, but I think he'd like this. I do not have a groove ring. I like the Original Blue. My daughter and daughter-in-law both would like these. I would like one for my husband. He doesn't have a traditional band and currently wears a silicone ring. These are awesome. I'd love it for myself and my husband. Looks very cool. My teenagers will go crazy for this. I'd love it for myself :) I don't lift weights but I run a lot and I get all sweaty and yuck so this would be great alternative to other rings. thanks! I have never seen these before, but I absolutely love them. I would love to have on for myself. Thank you for the chance. I love this for the gym! I do crossfit so this would work out wonderfully. I won't have to remove my wedding ring any longer. Those are pretty cool! They kind of match the fitness trackers. I do want this ring for myself. I worry about my other rings being uncomfortable or even dangerous when working out or using equipment. I would keep it for myself. I think this is very different. I would love to have this while I'm working out. I would love to test it out and see if i can feel a difference. I'd love to keep it to wear it to the gym. Id like to give this to my guy friends as a promise ring! I would give the ring to my Husband. I would love to have one of these for myself! I would probably like to keep a ring for myself~ They look so Comfy!! I would love to give one to my husband. Yes, I would love this ring for myself and thanks for this opportunity! Mine is a selfish action. No, I dont have a groove ring, but might to decide to purchase a ring. I'd like it for myself. I'm starting chemo on Monday and I'd like a few little things around to make me happy during those appointments. I would this ring for my fiance and I. He is a postal worker and an avid softball player. Uses his hands daily and sliding into bases is normal for him and this would be PERFECT! I would love to have them for myself! We have to take our rings off at work sometimes and this would be a way that I wouldn't have to! I would give it as a gift to my neighbor's daughter. I would give a groove ring to my friend.